NASA'splanet-hunting Kepler space telescope is set for a planned March 5 launch tobegin searching for alien worlds the size of Earth and bigger, mission leaders saidThursday. "We'reonly two weeks from launch and there's a lot of activities going on down at the Kennedy Space Center right now," said Jon Morse, director of theAstrophysics Division at NASA Headquarters in Washington, D.C. The probe,which is slated to blast off from the Cape Canaveral Air Force Station in Florida aboard a Delta 2 booster, will be searchingfor Earth-sized planets orbiting other stars in the region where liquidwater - essential to life as we know it - might exist. 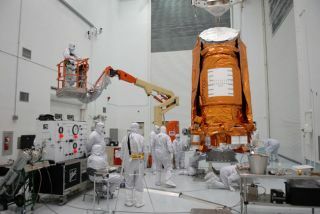 The spacecraft isexpected to move to its launch pad today, mission managers said. Over thelast two decades, scientists have spotted more than 300 extrasolarplanets circling other stars in our Milky Way galaxy. Most of these planetshave been about the size of Jupiter or larger, making it unlikely they wouldharbor life. "Mostof these planets do not have Earth-like sizes or orbits," Morse said. Over thecourse of its planned 3 1/2-year mission, Kepler will search the skies forplanets 30 to 600 times smaller than Jupiter - closer to an Earthly girth. Afterlaunch, Kepler will enter a 372.5-day orbit around the sun, trailing in Earth'swake. It is expected to be the first to find truly Earth-sized planets orbitingstars like our own sun. "Icall it our planetary census-taker," Morse said. AstrophysicistAlan Boss, of the Carnegie Institution in Washington, D.C., recently estimatedthat there are about ten thousand billion billion habitable planets in theobservable universe, with some of those being Earth-like worlds. Kepler willalso be looking for Earth-likeplanets, rocky bodies that orbit what is called a star's "habitablezone," the region where liquid water, and perhaps life, could exist. "Kepler'sdesigned to find hundreds of Earth-like planets if they're common around stars,"said Kepler principal investigator William Borucki of NASA's Ames Research Center in Moffett Field, Calif.
WhileKepler will be looking for planets thatcould support life, it won't actually find any little green men. "Kepleris not hoping to find E.T., it's hoping to find E.T. 's home," Boruckisaid. Keplerwon't yield any spectacular Hubble-esque images, but its 0.95-meter diametertelescope and array of 42 charge-coupled devices (light-sensitive microchipsalso found in standard digital cameras) will search for planets by measuringthe change in brightness that occurs when a planets moves in front of its star(from the perspective of Earth). Bymeasuring the amount of fluctuation in light and how long it lasts, scientistscan estimate the size of the planet, the size of its orbit and potentially eventhe planet's temperature. This sametransit technique is responsible for finding mostof the known exoplanets to date. Thepotential planets Kepler spots will later be further examined by Earth-basedtelescopes, to rule out false-positives and gather more observations. Kepler, aDiscovery-class mission, was selected by NASA in 2001. Its original price taghas risen over the last eight years, now reaching nearly $600 million.